Salt water has been used by multiple cultures over countless generations to clean wounds and rinse out mouths. Salt has antibacterial and preserving properties when applied in abundance to foods, but its affect on microbes when dissolved and diluted in water is less clear. Salt water changes the pH of the mouth, which deters the reproduction of many microorganisms, but it doesn't outright kill many forms. At the very least, salt water is soothing to the mucous membranes of your mouth, but it should not be swallowed in quantity. Talk to your dentist about the benefits of washing your mouth with salt water. The concern for oral hygiene dates back at least 5,000 years to ancient China and India. Many references are made to mouth rinsing and cleaning in traditional Chinese and Indian Ayurvedic medicinal documents and practices dating back to those early times, according to the book "The Way of Ayurvedic Herbs." Ayurvedic medicine is similar to traditional Chinese herbal medicine, but based more on personality traits called doshas. Teeth brushing and mouth rinsing became relatively common in Greek and Roman periods, and Hippocrates is said to have recommended a mixture of well water, sea salt and vinegar. Various seeds and herbs were also noted for the ability to freshen breath. Nowadays, many drugstore mouth washes are alcohol-based and contain a variety of antimicrobial compounds. Raw salt, which is primarily sodium chloride, restricts bacterial growth in many foods and preserves them because it absorbs water molecules. Bacteria need moisture in order to thrive, so without enough water they cannot grow well. Salt water is not considered an antibiotic because it provides bacteria with water and does not kill them upon immediate contact. However, according to a 2003 article published in the "British Dental Journal," salt water rinses are beneficial because they temporarily alkalinize or increase the pH in the mouth, which deters bacterial proliferation, as virtually all species prefer acidic environments. Further, salt water is isotonic and not irritating to mucous membranes, which is why many dentists use warm salt water rinses after dental procedures. 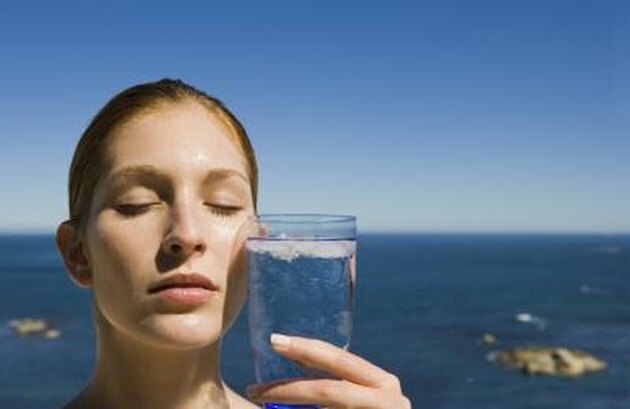 Salt water is sometimes combined with baking soda in a 50/50 ratio to increase the alkalizing affect. Half a teaspoon of each in a cup of warm water is a common dosage. Other ingredients that can be added to salt water or used alone to rinse your mouth include hydrogen peroxide, coconut nectar, aloe vera juice, sesame oil and sunflower oil. Hydrogen peroxide is a good wide-spectrum antimicrobial and kills bacteria on contact. Washing your mouth with salt water and spitting it out is harmless, but swallowing it in large quantities can be harmful. According to "Medical Biochemistry: Human Metabolism in Health and Disease," excessive consumption of salt water leads to dehydration, and if the water is too salty it might cause vomiting. Drinking some salt water is not a big problem and sometimes it is recommended for intestinal and bowel flushes, but too much salt intake can lead to a greater risk of hypertension or high blood pressure.